The monthly challenge for my card making workshop for November was, naturally enough considering the time of year, to make a Christmas card, but there was a restriction. We could only use blue and silver. Basically as soon as I heard this was the theme I knew what I wanted to do. I guess in a way it was cheating a little bit because it is a design I used last year, but never mind that. In the end it isn't quite as I imagined it because I expected to use blue card, and therefore the front would look a little different (mainly because the bauble would stand out a little more) but in the end I am pretty happy with how it worked out. I wouldn't have necessarily thought it was so hard to get blue and silver but there was really very little around in terms of papers, and even after looking at this paper lots of times over the last few weeks, I am not convinced that the paper I am using is not purple and silver. I asked in three different paper shops, and they all told me that that this was the only paper they had and it was definitely blue with a red tinge. Again, I would have thought that that made it purple, but what do I know! The other nice thing this month, was that I was finished making them all on Sunday of last week. I am afraid I can't take credit for this though really. I dobbed a friend of mine in to participate in the challenge. She has only started card making recently so she was freaking out a little, so she came around a while ago and spent the day trying to come up with a design. Last weekend she was freaking that she wasn't finished and so I went over there on Sunday morning and got them all made! She is definitely the organiser amongst my friends! Once again, my photo doesn't really do it justice I don't think! I really need to either learn to take better photos, or get a professional in! It's pretty and if its any consolation it looks blue! I like it! Very elegant looking and I agree, it looks blue in the picture. Great card! You have inspired me to get my Thanksgiving cards done. Hopefully, I can get them finished up this weekend in time for everyone to still receive them! By the way, I really enjoy your blog! It looks blue. The card is very elegant. I love that silver and blue look. I need some motivation, I wanted to make Christmas cards for the kid's grandparents. Don't think it's gonna happen. Oh well. I'm glad that it looks blue! Vickie, I need to start doing something about my Christmas cards. I am conscious that I am going to run out of time! Cindy, thanks for stopping by! I am glad I don't have to do Thanksgiving cards as well as Christmas cards! Oh it look beautiful and elegant! I love it! It look blue to me but then if I can see it closer, then maybe I can tell. But you did wonderful job! To help you out, here is the tutorial that I used to get the basic idea. 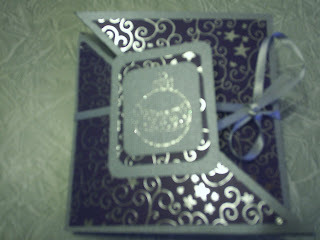 Your card is gorgeous, Marg! I really love the blue and silver combination. LOL! The woman who runs the sessions had bought the same paper for something she was doing in blue and silver so I got away with it!